Monastère des Pauvres Clarisses, Lourdes. Divine Providence is certainly at work today as we commend Sr Thérèse Marie to God’s embrace. On this Feast of the Immaculate Heart of Mary we gather for this Requiem Mass near the place where Our Lady revealed her title “Immaculate Conception” to the young Bernadette Soubirous. Today is also a day on which the doors of Franciscan and Poor Clare monasteries are open to all who celebrate another rôle model– the one who helps us to find so many things – St Anthony of Padua! We’ve gathered from different parts of Inis Fáil, from the green valleys of home and from the peaks and valleys of the Pyrénées to support this Poor Clare Community as they commend a good soul to God’s eternal care. Our sorrow is greater because Sister Thérèse Marie’s family (especially Dan and Gretta due to ill health) have not been able to travel from Douglas. The Gospel certainly speaks to our hearts as we seek rest for our souls this day. 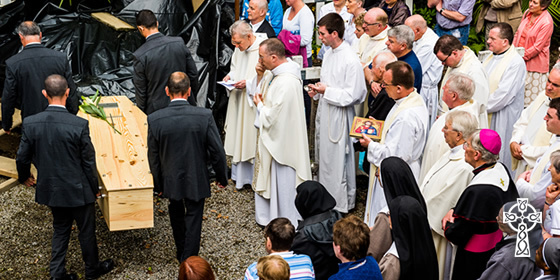 But there is also a deep sense of privilege that our time in Lourdes coincides with the time when an Irish sister is carried for burial in the heart of Lourdes. We’ve gathered here because Mary Teresa O’Connell responded to God’s invitation back in 1958. Perhaps she had heard the call on a number of occasions in previous years at home in Cork. It was eventually in the Monastère des Pauvres Clarisses that she felt she could “cross over” from work in a souvenir shop on rue de la Grotte to be a postulant and novice within these walls. As a 35 year old, she could hardly have imagined that her change of life would involve 57 years of living out her vocation here in this community! 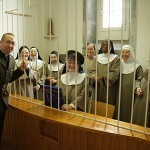 She exchanged the familiarity and comfort of a parlour at home in Mallow with this Convent’s Parlour – a place where thousands of us from Ireland and all around the Pyrénées have been made welcome. Today is a day on which we should thank God for her parents and all the O’Connell family, her onetime souvenir shop colleagues in Lourdes and the Poor Clare Community who encouraged her as she discerned her vocation in her mid-thirties. It would be an understatement to mention that Thérèse Marie never lost her Cork accent! Her voice and tones have become familiar to so many people in various cadences of the French language. Sr Marie Emmanuelle (her onetime 21 year old fellow-novice) tells me that there was no shortage of grammatical errors during the early days. Plenty of laughs in the community were as a result of the novice from Cork coping with a new pace of life in the enclosure. Sister’s favourite prayer on her lips to the end “Jesus Mary and Joseph, I give you my heart and my soul … Jesus Mary and Joseph may I breathe forth my soul in peace with you” certainly reflects a sense of allowing our heart and lungs to be in communion with God’s presence through the sacraments and personal prayer. Our visits here over the years have reminded us of the need to deeper our interior prayer which has marked our visits here at this Embassy of Prayer and Welcome. All who visited the parlour have sat waiting for the bell to be rung. We’ve listened to the river Gave flowing past the high open window; in these moments, we knew that we would be met by someone who would listen to us with her ears, her eyes and her heart. We would meet someone who would continue to keep in contact through Christmas letters and beautiful handwriting – even if the Christmas post arrived in the month of February due to her workload! If only in our own busy lives, we could take time to write similar paragraphs of apology for our overdue contact with others! Sr Thérèse Marie’s wisdom – like that of many contemplatives and all who spend time in Eucharistic Adoration – was delivered with a surprising freshness and a deep awareness of the changing realities of family life, unemployment, emigration and worries about health. This wisdom and freshness of Christian care finds an echo in religious communities around Ireland and in the dioceses at home where young and old spend time in Eucharistic Adoration. So whatever about the comical errors or wrong pronunciations or “faux amis” which the young Mary Teresa O’Connell had during her early years in the convent, there’s not a single one of us today who can fault her on the impeccable timing of her death last Thursday morning. Her final breath at 10:00 was so gentle and peaceful that the sisters were not able to distinguish the “maintenant” or the “hour of her death”. 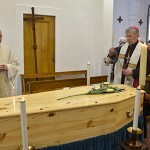 Her death on the eve of the Cork & Ross pilgrimage meant that Sr Thérèse Marie’s coffin today is surrounded by a circle of prayer led by Bishop John Buckley, Bishop Patrick O’Donoghue, priests and pilgrims both young and old who share her Cork accent. Today is the first occasion when she will not inhale the incense offered in the sanctuary. Our Gospel instead assures us that she is filling her lungs with the air of God’s Paradise in Heaven. The grace of a happy death for us in our Irish tradition is also a wish to this Poor Clare community. Our presence in such numbers leaves the eighteen sisters who remain in no doubt that this Cork woman was a valuable “turbine engine” in this powerhouse of prayer. During the sixth apparition of Our Lady, Bernadette described a sadness which came over Our Lady’s face. It happened as “The Lady” looked into the distance observing the hardness of people’s hearts. She asked Bernadette to pray for sinners and to do penance. Then her eyes turned back to Bernadette and she began to smile again. Isn’t this a mirror image of what happened to many of us while we sat on the other side of the monastic enclosure with Sr Thérèse over the years. A moment in the conversation would come when she might look up over our heads and express a concern about the current state of the world. She’d lift her eyes and her hands up and then say “all we can do is keep our prayers going.” And then her gentle face would look us again in the eyes and encourage us to live the present moment trusting in God’s care. The message is still the same – there is no substitute for prayer and penance! During this year of Consecrated life, Pope Francis has asked religious communities “to look to the past with gratitude, to live the present with passion and to embrace the future with hope.” These words certainly find an echo in the charism of St Clare, of St Francis or indeed St Anthony. 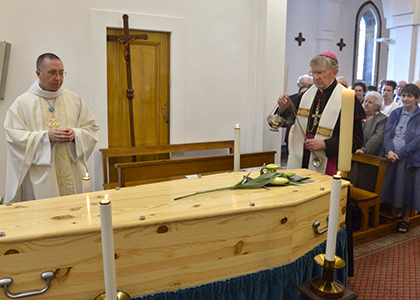 With these three intentions of prayer, after we have laid Sister’s coffin to rest in the Monastery Cemetery we will continue our work here in Lourdes and at home glad to have met Christ’s calm and peace here during Parlour visits. We renew our sense of gratitude for Sr Thérèse Marie as she helped the breath of God to refresh our lives. We give thanks that her breath held out until her friends from near and far could be completely present around her coffin!! And looking to the future, we pray that many more women and men from Inis Fáil will answer God’s invitation to joyful and faithful service in the consecrated life. We commit ourselves to supporting all who are discerning a religious vocation. 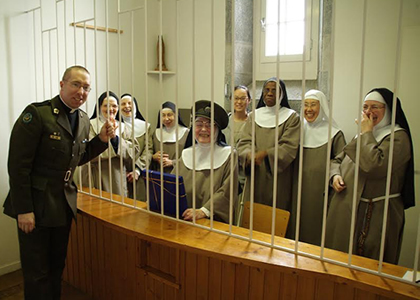 In this way, hopefully in the near future another Irish sister will be present in this beautiful Monastère des Pauvres Clarisses to be called by the Parlour Bell to meet and share wisdom and prayer with Irish pilgrims, English speakers and many locals from the Pyrenées. Adieu dear Sr Thérèse Marie. 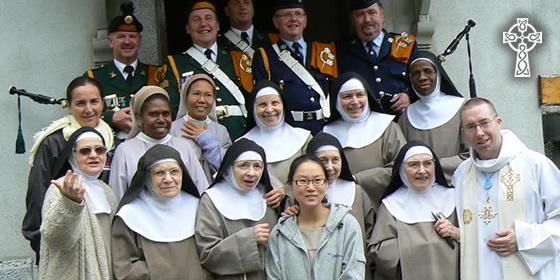 DF bagpipes visit the Sisters’ Enclosure in May 2008 to mark the 50th anniversary of the arrival of Sr Thérèse-Marie (front right) at Monastère des Pauvres Clarisses. Homily preached by Rev Robert McCabe CF on Saturday 13 June for the Requiem Mass of Sr Thérèse Marie. Her prayerful support for Irish pilgrims began in 1958 – the first year of the International Military Pilgrimage. Sister spent the month of May looking forward to hearing the bagpipes and receiving visits from Irish military personnel. 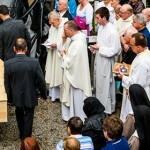 Mourners from Ireland were led by Most Rev John Buckley who presided at the Mass and led the Prayers of Commendation.